The discovery of the 51.49-carat rough "is a very promising event"
Alrosa has announced the recovery of the first large gem-quality rough diamond from Verkhne-Munskoe deposit, which was commissioned on October 31 of this year. The 51.49-carat rough is a round-shaped octahedron crystal with insignificant yellow hue. According to Alrosa, “the approximate age of the extracted crystal is over 350 million years”. Verkhne-Munskoe diamond deposit is located in Western Yakutia, 170 km from Udachny. The deposit, in which four kimberlite pipes have been explored so far, is estimated to have some 1.8 million carats of rough diamonds per year, and Alrosa says it has reserves for more than 20 years of mining. 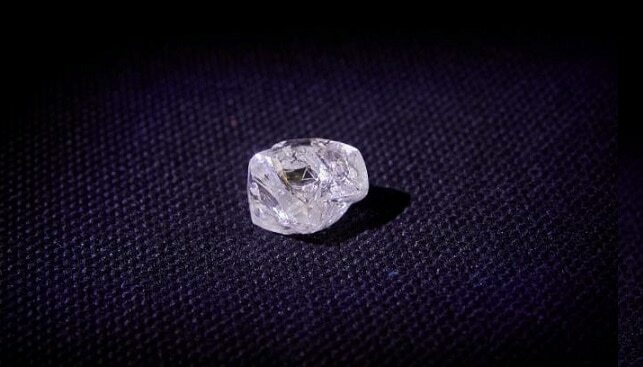 Alexander Makhrachev, Director of Udachny Mining and Processing Division, commented: “It is the first rough diamond over 50 carats from Verkhnyaya Muna. We have just started mining here, so it is a very promising event evidencing of the good potential of the deposit. despite small inclusions and cracks, this stone is undoubtedly a gem-quality rough diamond that will bring to life one or several high-grade polished diamonds”.